DRY HAIR CONDITIONER NOURISHING CONDITIONER Nourishing conditioner designed for dry and dehydrated hair. Benefits: Gently detangles, nourishes and deeply repairs dry hair. Restores the shine and softness of the hair. How to use: Apply to wet hair, distributing evenly. Leave on 3 / 5 minutes. Rinse thoroughly. ANTIOXIDANT CONDITIONER Rejuvenating Conditioner The formula of this conditioner is aimed to invigorate and strengthen the hair fiber from the roots, for stronger and more protected hair. Detangles without weighing hair down. Benefits: It plays an antioxidant action against the harmful effects of free radicals. It has a restructuring, moisturizing and toning effect. How to use: Apply to wet hair, distributing evenly. Leave on 3 / 5 minutes. Rinse thoroughly. Lightweight Duo-phase formula that repairs hair, making it easy to detangle, strong, healthy, flexible and silky. Its Keratin, Silk protein and Vitamin complex active ingredients hydrate, nourish and protect the hair structure and damaged ends. Constructed with glycerol and coconut oil, the Serie Expert Nutrifier conditioner offers just the right dose of nourishment to dry hair. Glycerol helps to hydrate and nourish, while coconut oil brings shine to the hair. This silicone-free conditioner cleanses and leaves the hair softer, more supple and shinier. Apply evenly to towel-dried hair. Lather. Rinse thoroughly. In case of contact with eyes, rinse them immediately. Paul Mitchell Color Care Protect Daily Conditioner. Detangles and smoothes color-treated hair, so locks look and feel soft and hydrated. Sunflower extract protects hair from sun damage, while conditioning extracts moisturize and boost shine. Provides UVA and UVB protection, and helps prevent color from fading. Use: Apply a small amount. Massage. Rinse. 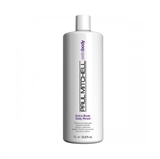 Paul Mitchell Extra-body Daily Rinse Detangles and adds volume to fine hair, leaving locks full of body, bounce and shine. Panthenol boosts body and helps repair damage, while wheat-derived ingredients help prevent damage and leave hair silky smooth. Helps repair and prevent damage caused by blow-drying and styling. Use: Apply to wet hair, massage in, rinse thoroughly. Paul Mitchell Forever Blonde Conditioner. Deeply hydrates and detangles lightened and highlighted blonde hair. KerActive and safflower oleosomes help smooth and repair. Helps subtly brighten blonde and highlighted hues. Use: Apply to clean, damp hair. Comb through. Rinse. Paul Mitchell Instant Moisture Daily Treatment Hydrates and detangles moisture-starved strands, making hair shiny and manageable. Soy proteins, shea butter and Instant Moisture Complex moisturize, strengthen and add elasticity. Panthenol builds body and repairs damage from the inside out. Strengthens the cuticle and improves elasticity. Use: Apply a small amount. Massage. Rinse. 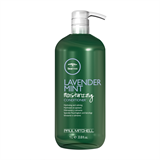 Paul Mitchell Lavender Mint Moisturizing Conditioner This soothing quencher hydrates, detangles, softens and replenishes dry, thirsty hair. Ultra-rich conditioners hydrate moisture-starved hair, while calming lavender, mint and tea tree soothe mind and spirit. Use: Apply to wet hair, massage in, rinse thoroughly. Paul Mitchell Lemon Sage Thinkening Conditioner. It thickens your hair, giving it more strength and added moisture. With its unique blend of thickening agents, the lightweight Paul Mitchell Tea Tree Lemon Sage Thickening Conditioner boosts volume and thickens your limp hair while helping to reduce static. Containing natural extracts of lemon, sage, peppermint and tea tree, this conditioner promises to stimulate your senses and provide an energising experience. Directions of use: Apply a small amount of Paul Mitchell Tea Tree Lemon Sage Thickening Conditioner to your clean damp hair. Massage in. Rinse completely. 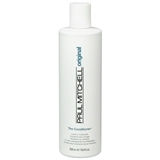 Paul Mitchell Original The Conditioner. Smoothes hair, reduces static, prevents dryness and gets weary strands back in shape. Hawaiian awapuhi helps balance moisture, while wheat-derived conditioners improve hair texture. Doubles as an excellent moisturizer for skin.